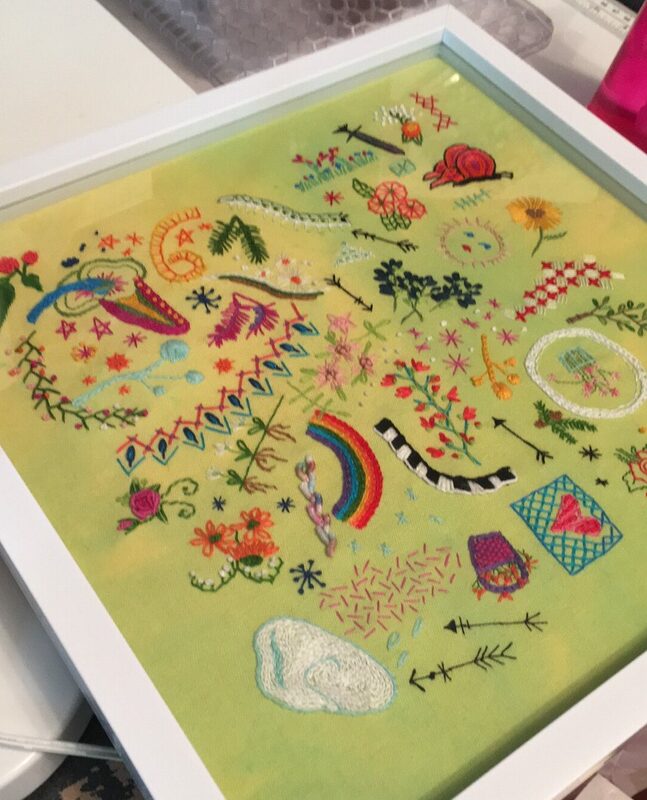 Embroidery…not just for me anymore. Embroidery had become a passion of mine. This is the result of a One Year of Stitching Challenge that I joined from a Facebook group, you can find it here. These are the culmination of 60 days of one motif stitched each day. It has been gifted to a friend. Stitch, in all it’s forms, has been a part of my creative practice from the age of three. Yes, three! What were the women in my family thinking?!? They put a needle and thread in my hand and I worked a small “apple” pot holder with six strands of cotton floss. It was a way to connect with my Great Grandma HooHoo and Grandma Lauritsen. 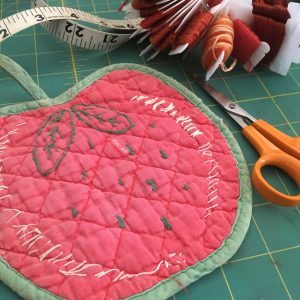 They let me “sew” whenever they were stitching and it kept me quiet….I LOVED IT! Just as all things done “just with Grandma” become special and sacred, embroidery is just that. Special. Sacred. Just for me. Until, Ashley said she wanted this. That she loved it. Wow! Who knew that something I loved to do, just for me, would make her sooo happy? That is the gift for me. I have been stitching up something almost daily for 50 years. Somedays on a sewing machine, some days with hand sewn stitches, somedays just dreaming up the next thing. My mind is always planning the next idea. I really don’t plan the actual stitch designs, just what colors I like to work with and organizing my threads and fabrics. The serendipity of the process is where I find the joy! Just letting things flow through my head. I don’t use patterns usually. I make all kinds of things, in all kinds of ways. Making is what I do. I am a maker.